With small town charm and uptown pizzazz the city of Waconia, is a fun lakeside community just west of the Twin Cites, bike friendly and ready for you to explore. Nestled along the southern shores of Lake Waconia, in Carver County, the area boasts many year round activities including; sailing, boating, fishing, water skiing and swimming, just to name a few other recreational opportunities when not touring around on your bicycle, while visiting. The town’s tourism draw was sparked in 1884 when Coney Island, in the middle of Lake Waconia, was turned into a resort. A future planned park area there in a few years, today the mainland has become very popular as a resort community to take its place. Its friendly parks, streets and nearby trail makes it easy to explore all of Carver County. The warm, welcoming community of Waconia is located less than 45 minutes west of the Twin Cities. Its lakes and surrounding wildlife help make the town a relaxing locale for tourists from all over. To describe the town as “bike-friendly” may be an understatement. Most of its streets cater to those who prefer pedaling their way around, which makes exploring the area much easier. You can visit one of its several lakes, or immerse yourself in the town’s history. There’s also many locally-owned shops to browse, and restaurants to satisfy your appetite. The area has plenty to offer those who prefer to get around by bike. There’s access to trails that take you beyond the town’s border, and bike-friendly county roads that allow you to explore everything the town has to offer. There’s something for everyone to enjoy. The northern part of the town has access to the Dakota Regional Trail. Part of the Three Rivers District, you can actually ride it all the way to Wayzata. 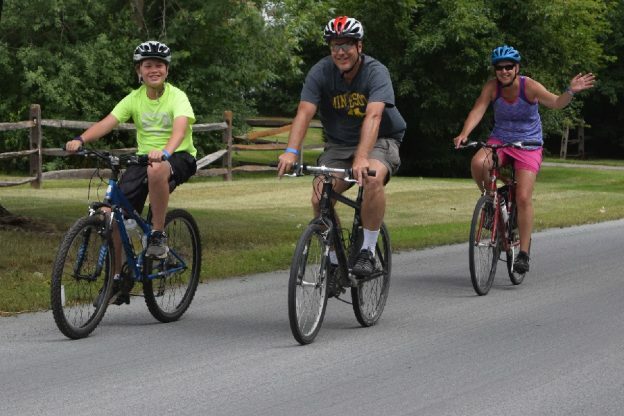 The paved trail’s Waconia section will take you through its neighborhoods and wildlife. You’ll also get a nice sneak peek at Lake Waconia. The park, managed by the Three Rivers District, provides access to the Lake Minnetonka LRT Trail. It’s another trail that can take you beyond Waconia if you wish for a longer ride. If you don’t want to stick to the trails, then you’re in luck the town is full of bike-friendly roads that allow for almost limitless exploration. It also has plenty of shops, restaurants, history, and more to fill an entire weekend. Be sure to check out our At-A-Glance Waconia Article for more details on where to stay, play, and explore for your hand-held devises. As this story and the At-A-Glance Article are mobile-friendly for your convenience, have fun! This entry was posted in Destinations, News and tagged #DestinationWaconia, #next adventure, #nextadventure, #nextbikeadventure, #onlyinMN, #threeriversdistrict, Carver Park Reserve, Dakota Regional Trail, Destination Waconia, Lake Minnetonka LRT, next bike adventure, Three Rivers District on February 28, 2017 by Andrew Ellis.